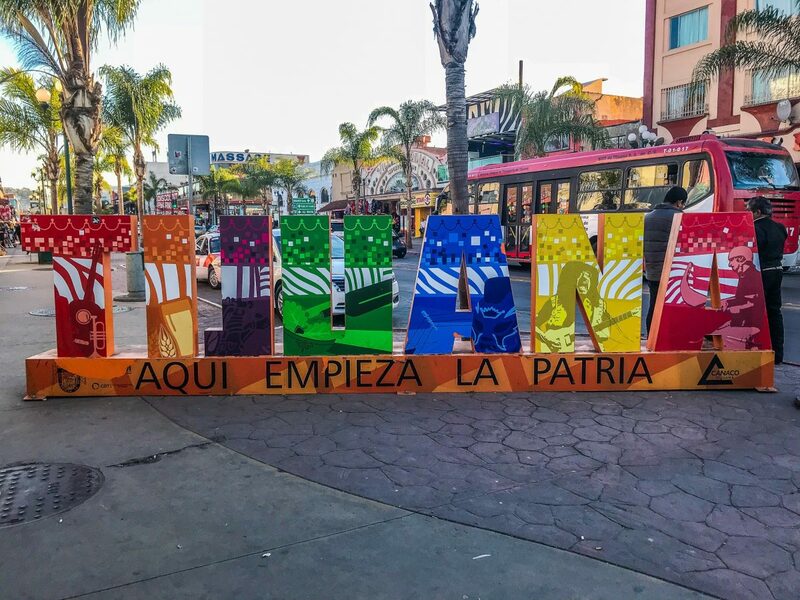 Wondering what to do in Tijuana on a day trip (or overnight trip)? While I have to admit, I mostly went for all of the craft beer in Tijuana, we also checked out a few cool spots in between sampling. There are plenty of great Airbnb places to check out in Tijuana. If you want to be right in the thick of it, I really love the style and location of One Bunk Tijuana. They are a full-service hotel, but you book with them through Airbnb. They’re located right on Avenida Revolucion and have rooms of varying price depending on whether or not they face the noisy main street. If you have never used Airbnb before, you can sign up with this link and receive up to $35 off of your first booking. One of the main reasons I went to Tijuana in the first place was to check out the best craft beer scene in Mexico. In fact, Tijuana is basically the birthplace of craft beer in the country. There are literally dozens of small-batch breweries around this border city and you could easily bar hop every night for three days and still not try them all before you have to get back to work on Monday. Border Psycho – this is perhaps my favorite brewery in all of Mexico and maybe, um, ever. Their IPAs are outstanding – fruity, refreshing, hoppy, without being too high in alcohol. Mamut – this is a tiny little brewery bar that I really loved. Their amber and dark beers are some of the best I had in Tijuana. Teorema/Lúdica Co – this is a shared brewery bar between the two breweries Teorema and Lúdica. I loved being able to sample so many different beers in one place and the bar itself is pretty cool. It has a giant Jenga and a few other board games to play while you enjoy your drinks. Playa Tijuana is a lovely beach in summer and a relatively nice beach to walk along for every other season. I visited just after New Year, so it wasn’t the best weather, but the beach is long and great to walk along. It’s also THE place to head if you want to enjoy some Baja-style fish tacos or other nice seafood. There are vendors around a lot of the parking lots, but there are also a few nice restaurants to check out here, too. One of the reasons to head into the many restaurants that line the malecon, or boardwalk, is so that you can enjoy true Norteño music. This is the sort of folk music of this region of Mexico. It’s not everyone’s cup of tea, but I really enjoyed the upbeat tunes while I ate my fish tacos. This was a completely wonderful surprise to stumble upon during my trip to Tijuana. Even if you don’t enjoy museums, the outside of this building is worth a trip away from the downtown area. Plus, it’s across the street from Plaza Fiesta, one of the best clusters of craft beer bars in Tijuana, so you can enjoy a bit of the museum and then rehydrate at Plaza Fiesta. Inside the Tijuana Cultural Center, you’ll find an Imax with different educational movies. There is also an area of the museum dedicated to local artists, both regional and national. This was my favorite part. 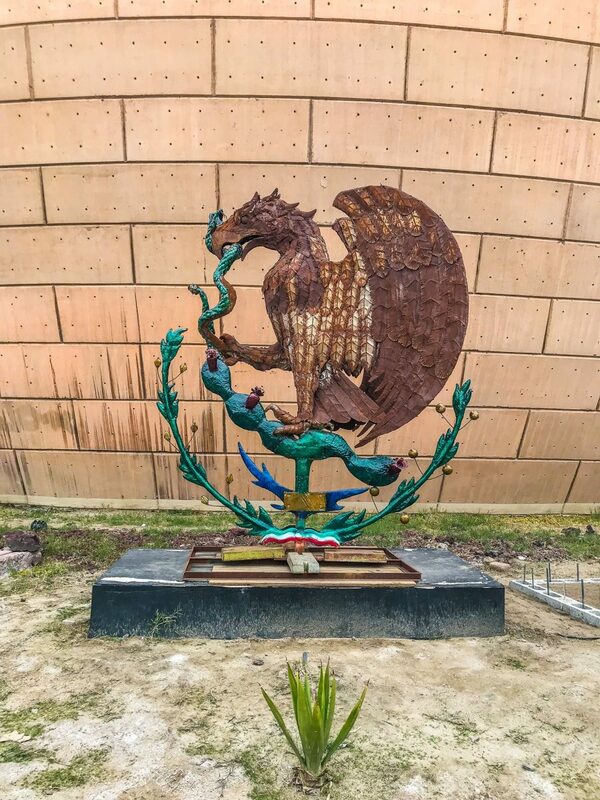 There is also a part of the museum where you can learn more about the history of this region of Mexico. 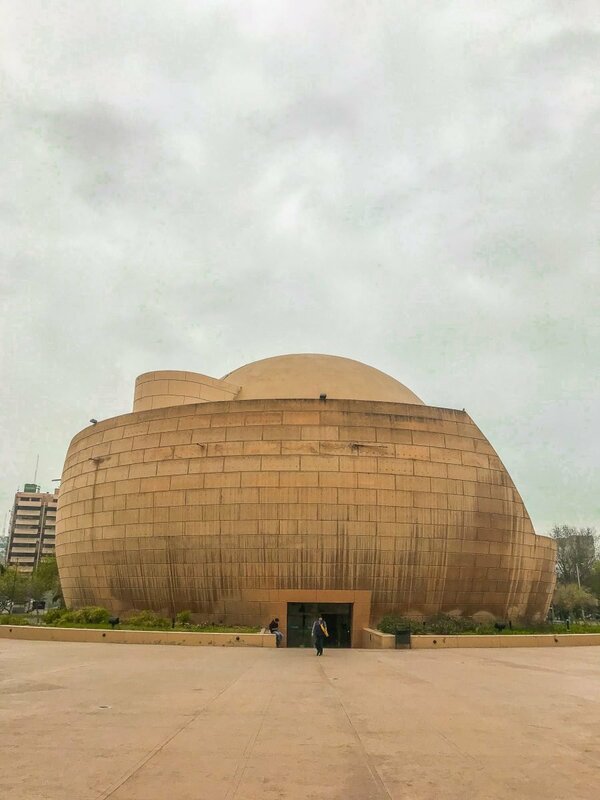 It’s the largest museum in Baja California, so if you have been to other parts of the Peninsula, you may find this quite interesting. Just be warned, the majority of the signs are in Spanish only. This is the main street in Tijuana and one of the best places to head if you simply want to get out and stroll. The street is several blocks long and is where you’ll find lots of pharmacies, bars, restaurants, cafes, and taco spots. It’s also where you’ll see the famous “zebras” which are really just donkeys that have been painted to look like zebras. Thankfully this is dying out more and more. If you find it sad, please avoid taking any photos and supporting this in any way. The less frequently people pay for this, the faster it will disappear. If you are crossing the border from San Diego into Tijuana by foot, well, then you’ve already checked it out. If like me, you flew into the Tijuana airport, you may be curious about checking out the border for yourself (like I was!). There is a footbridge that you walk across where you’ll really be able to see the border crossing. I found it so fascinating. Having crossed borders in countries with much less security (Laos, Cambodia, Thailand, Vietnam), it was really interesting to make a comparison. I’ve also crossed the land border between Canada and the USA in different places, but always in a car, so it sort of just looks like a toll booth. This looked very different. 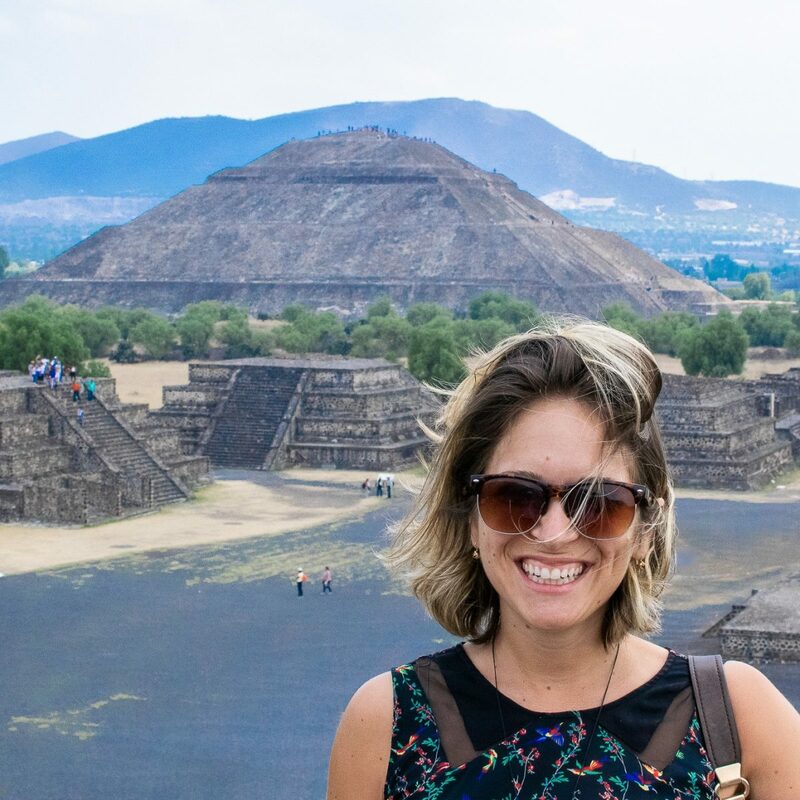 If this is your first trip to Mexico, then you’ll likely want to check out a traditional Mexican market. These are basically covered markets that are open most days of the week. You can buy just about anything at a traditional mercado – fresh fruit, vegetables, meat, fish, dried foods like pasta or rice, clothes, shoes, and kitchen gadgets. There are also usually a few food stands where you can get a fresh juice, a taco, or something even more filling. Mercado Hidalgo is the most centrally located market in Tijuana. It’s located a few blocks from the Cultural Center, so you can combine the two into one trip if you are only in the city for a short time. It’s also the place to head for a few nice souvenirs, but just be aware that you may be offered a very different price to what the locals are paying, especially if you don’t speak Spanish. There are SO many good tacos in Tijuana. 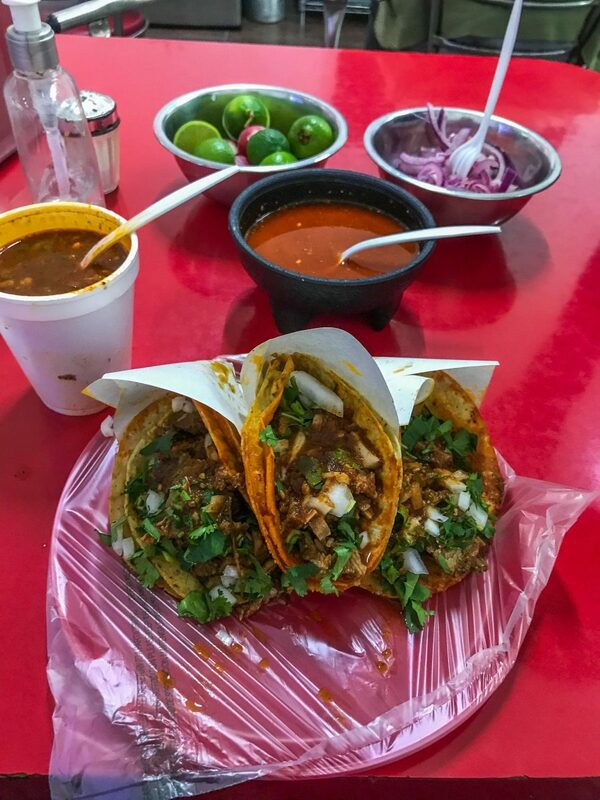 While I didn’t make it to the famous “taco alley” that Anthony Bourdain went to, I did enjoy my fair share of tacos around the downtown area. One of the best things to try in this area, according to all of my Mexican friends, is the Birria. 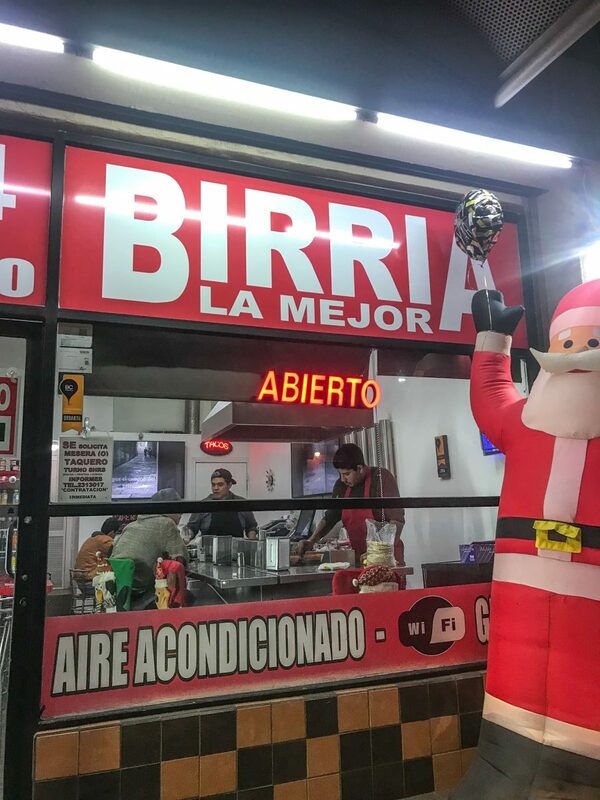 Everyone I spoke to in Ensenada agreed, the best birria in the region is in Tijuana. So eat birria we did. The best tacos I’ve had in a long time were at Birria La Mejor. It’s located just off of Avenida Revolucion and there’s even a sign on the corner pointing you to their front doors. It might be a well-known spot, but it’s well known for good reason. The tacos were truly mouthwateringly good. Just thinking about them now is making me hungry. Take note of the presentation of tacos in Tijuana. In all of the places I’ve visited in Mexico, none have made the tortilla into a cone and then topped that cone with meat. Each taco I had was always individually wrapped in paper keeping them nice and hot and from getting too soggy. One of the more famous pit-stops on a tour of Tijuana, Caesar’s Restaurant and Bar is the birthplace of the Caesar salad. If you want to enjoy this in the way it was originally created, then head here and order it. They make the whole thing table-side, so it’s a bit of a show, but it certainly won’t keep you full. It’s only a small salad. That being said, it’s still a fun experience and worth checking out if you enjoy food history. This little plaza is the oldest in Tijuana and located near the top of Avenida Revolucion. It’s where the arch is with the little clock. This is actually nicest at night when the arch is lit up and changes color every few seconds. The arch is there to represent the link between the United States and Mexico. 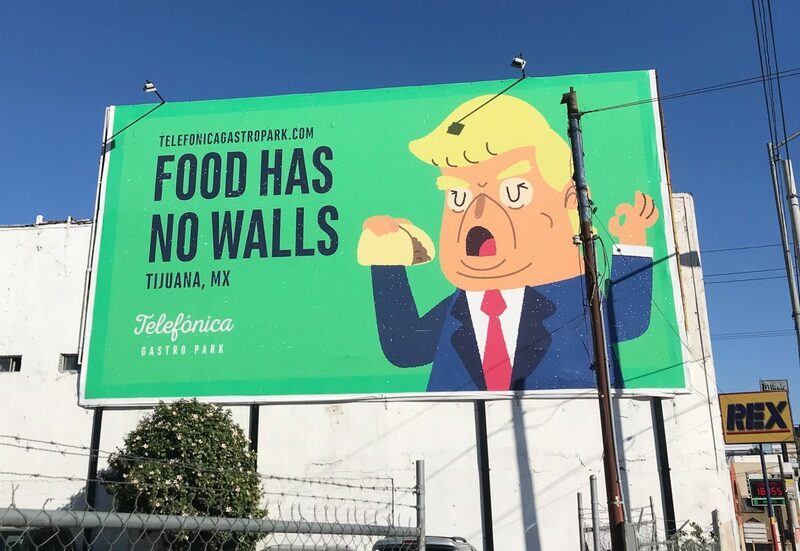 There is also a nice Tijuana sign there if you enjoy the tourist signs that scatter the country. Foodies should not skip going to Telefonica Gastro Park. This is a glorified parking lot that has been filled with food trucks, picnic tables, and seriously good food. It was particularly nice on a sunny day. You can order from any of the trucks and they’ll bring your food to whatever table you choose. You’ll find everything from slow roasted barbecue to healthy poke bowls, artisan coffee to craft beer. It really has a little something for everyone, including vegetarian and vegan options or plates filled only with meat and cheese. Tijuana is awesome and I really believe that it gets left off of people’s Baja itineraries way too often. It’s packed with great beer, seriously good food, a nice beach, and did I mention the hipster restaurants and artisan coffee shops everywhere? Don’t let this city’s bad reputation fool you. 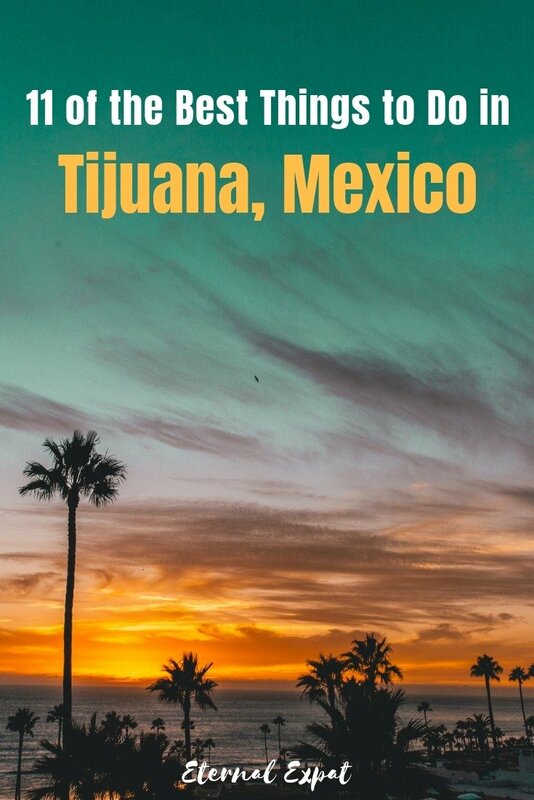 Tijuana is safe for visitors and it’s somewhere you can easily get to. That being said, a few days, three or four, is plenty. If you have a whole week, I highly recommend renting a car and heading south. Between Tijuana and Ensenada are tons of tiny little beach towns with cheap hotels and even cheaper seafood. A trip to Ensenada is worth at least a few days if only for the amazing seafood there. While you’re down there, don’t skip out on Valle de Guadalupe. The wines there are delicious (and cheap! ).